Hello! I just wanted to say thank you so much to all of my wonderful blogging friends for all of your kind words, thoughts and prayers. I am finally feeling better!! On top of all of the other stuff I ended up with the flu too! I was beginning to wonder if I was ever going to start feeling better again-lol! Luckily I was the only one in the house that got really sick. Eric ended up with a bad cold for a few days but the kids didn't get it *knocking on wood*. Today I have a card to share with you that I made awhile back for Eric, for his birthday and I keep forgetting to post it. I took three pictures of the card all at different angles, because depending on how you look at it you see a different picture. 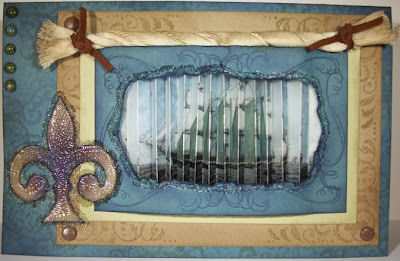 Do you see two ships? I thought this was so neat! 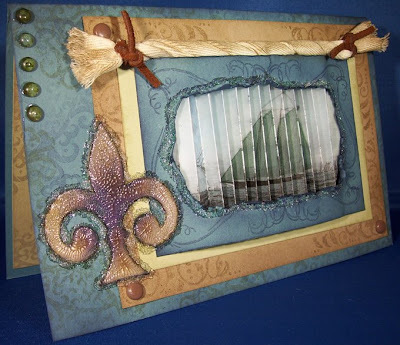 The picture of the ship is a printout and then you do an accordion fold. I printed this one out on vellum and then added some color to the back using Copic markers. 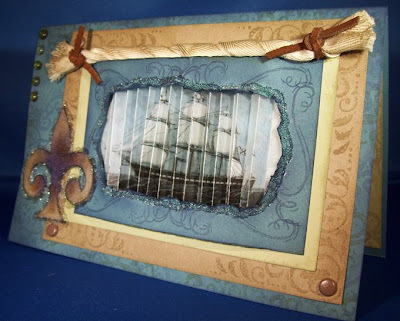 I found the pattern for the ship at Circle of Crafters, if you haven't ever been to the website you should check it out, they have lots of fun ideas!